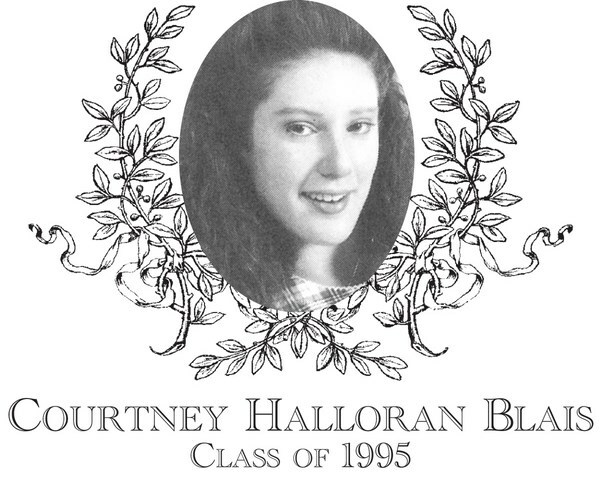 Courtney Halloran Blais, Class of 1995, was an outstanding three-sport athlete at Bartlett High School participating in soccer, basketball, and track and field. She played JV Soccer her sophomore year as goalie and Varsity Soccer her Junior and Senior years. A highlight of her soccer career was that she did score a goal off of a corner kick which helped to get the team into the state finals. She had never done any running or field events until she signed up for Track in her freshman year. Her main events were the 800 (her best event), 4 by 400, High Jump, and Shot Put. She medaled in Shot Put in the state semi-final meet one year. She was captain her junior and senior years and was MVP in her senior year. She lettered in both years. Courtney played basketball all four years of high school. She was a varsity starter her sophomore through senior years. She was one of the varsity captains both junior and senior years as well as MVP of these years. She was named Telegram and Gazette All-Star twice. In high school she had a 3.89 GPA, was on Student Council, the National Honor Society, on the Math team, and in the Peer Mentor/Leadership Club. At Clark University, Courtney had a 3.5 GPA. She was member of the Honor Society. She was a 4 year basketball starter and scored over 1,550 points while there. She was the captain of her team both her junior and senior years. She was named the Top Female Scholar Athlete both junior and senior years, and she holds the all-time leading shot percentage title at Clark. She graduated from Clark University in 1999. She went on to earn her Master's Degree from Fitchburg State College in High School Guidance Counseling. She also earned her Initial Teacher License fromWorcester State College in Moderate Disabilities teaching. Courtney works as a Special Education Math Teacher and resides in Worcester with her husband Tony, 3 year old twin boys Anthony and Kael and 3 month old Finnegan Jacob.